A robust mobile marketing plan is crucial for restaurant owners and managers. 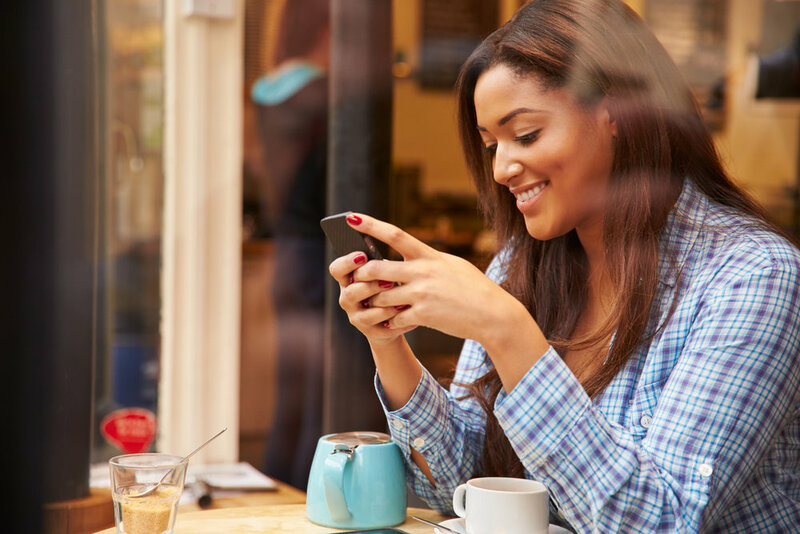 With 68% of today’s businesses integrating a mobile marketing strategy into their daily outreach, it’s vital that today’s restaurant owners get on board with mobile. So how does your restaurant go about implementing a mobile strategy? One powerful and affordable mobile plan that you should not overlook is messaging apps. Adopting a way to use tools such as SMS messaging, Facebook Messenger, and WhatsApp as part of your mobile marketing will likely increase your conversion rate by 64%. So how do you go about implementing a messaging plan into your mobile marketing strategy? Simple, take a look at the ways your competition is integrating messaging and then do it better. Since paying attention to what others are doing is not always that easy, we’ll show you how some restaurants are using messaging. Customer retention is vital to the success of your restaurant. In fact, repeat customers spent 67% more than new customers when eating out. As a restaurant owner or manager, you need to make sure that part of your mobile marketing strategy is aimed at these repeat customers. But how? Simple—use broadcast lists in WhatsApp. Creating broadcasts lists is a free and easy strategy to increase customer retention. The most challenging part of creating these lists is getting customers to opt into your list. 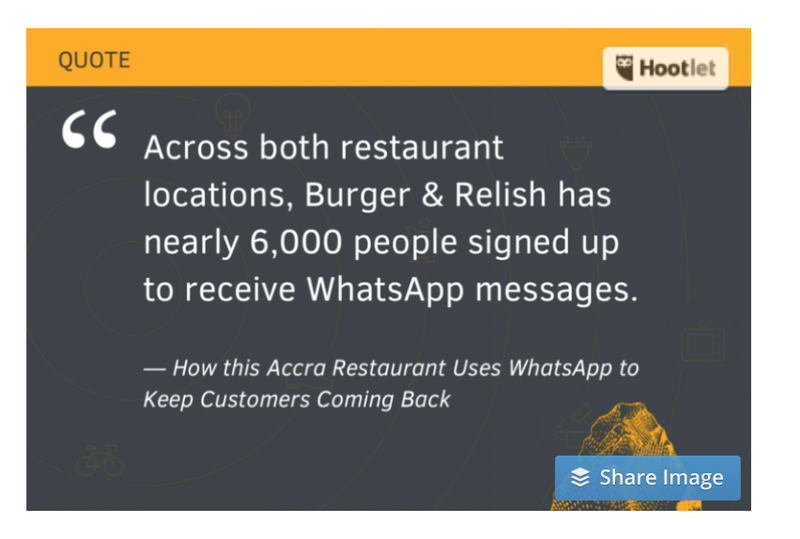 Burgers and Relish, an American style diner, mastered the art of the WhatsApp opt-in by using their wait staff. They played on the customers’ fear of missing out. The strategy was straightforward. Make sure the customers are enjoying themselves. Mention other events that will occur during the week. Ask the customers if they’d like to get reminders about events. Ask the customer to add the restaurant phone number to WhatsApp. This strategy landed Burgers and Relish about 6000 people on their contact list to receive messages. Getting the number is just the first step. WhatsApp allows you to put 256 people on one broadcast list; however, you can create as many lists as you’d like. Where most restaurant managers fail using WhatsApp is by just dumping names and numbers into a list. A more segmented approach to using broadcast lists is a significant factor in creating customer loyalty. Customers like to feel like you know what they want, and that’s exactly what Burgers and Relish did to achieve the success they did. They created segmented lists like family, young adult, couple, and students. Then they targeted their messages to the correct audience. The result? Brand loyal happy customers. You could easily implement this type of plan into your mobile strategy. All you need is a WhatsApp or another messaging service and a motivated wait staff. The best part, it’s free! There’s nothing like a sense of urgency to get people to act quickly. And, as a restaurant owner, you can capitalize on this need by sending out flash sales, limited time offers, and coupons. The next 25 groups through the door receive a free appetizer. For the next 2 hours, we are offering 20% your bill. From 5 till 7 today we are offering $2 mixed drinks. The list of ideas is endless. Keep in mind that 57% of shoppers are motivated to try something new when they are given a discount. Experiment with different types of coupons and sales and see which ones get the best response. Then grow your ideas from there. 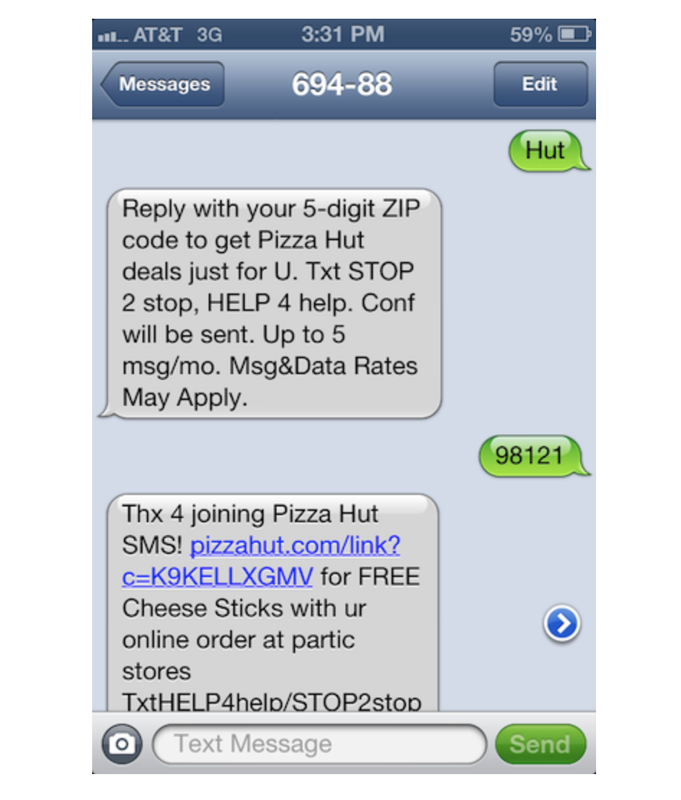 That’s exactly what Pizza Hut did in its most recent SMS campaign. The marketing team at Pizza Hut understood that targeting your audience is crucial. So, they experimented with geofencing as its targeting strategy. For a 15-month period, the pizza giant sent out SMS coupons to customers on their list who entered a ½ mile radius of one of their locations. The results of using SMS and targeting customers were incredible. It was 4.4 times more effective than TV ads. It was 2.6 times more effective than print ads. And, it was 146% more efficient than their other marketing approaches. Restaurants who have a well-planned reservation system benefit from it tremendously for several reasons. They increase the number of guests during slow times because you spread out the number of people in the building. Your parents and your grandparents may prefer a phone call and a human when it comes to communicating. But, millennials want speed and convenience. That would explain why over 2 billion messages were sent on Facebook Messenger between consumers and businesses. As a restaurant owner or manager who understands the benefits of a solid reservation plan, you can lighten your load when it comes to communicating with people who are not in your building by taking advantage of Facebook Messenger’s ability to make reservations. The facts are simple. Studies show that 69% of consumers prefer to interact with a bot when communicating with brands. And, you need to be out and about in your restaurant and not on the phone taking reservations. So, a bot reservation system like the ones that can be easily added to Facebook Messenger are the perfect solution. Facebook Messenger bots allow you to accept reservations from your Facebook Page in the same conversational tone that a human would use when messaging. If you are unsure how to set up bot reservations, don’t worry. There are over 100,000 bot developers out there. And they are mostly subscription services that come at a very reasonable price. One thing that many restaurant owners worry about when it comes to reservations is no-shows. When people don’t show up, you lose money. But, with messaging apps, you can send links and reminders to patrons about their upcoming reservations. In fact, recent studies show the reservations reminders decreased no-shows by 23% which averages out to about $2,900 a month. 80% of smartphone users rely heavily on chat apps. As a restaurant owner, you need to look at this as a direct line of communication with a large percentage of your customers. Without a robust mobile marketing plan in place that includes messaging apps, you are falling behind the competition. The bottom line is straightforward. Your customers may think that you make the best wood-fired pizza in the area. Or, they may feel that your steaks are better than the restaurants down the block. But, the fact is they are looking at their phones 80 times a day. And, if your competition is literally staring them in the face and offering them discounts and convenience it’s likely that your customers are will head past your door and down the block. About the Author: Anastasia Sviridenko is a content marketing manager at TextMagic, a bulk SMS software solution. When she’s not working, you can find her wandering through a bookstore, or sipping on a coffee at home.